FULLERTON, Calif. – April 4, 2019– Goodwill of Orange County opened the doors to its newly relocated Fullerton store to a crowd of more than 100 on Friday, March 22. The store joined popular tenants, including the original Polly’s Pies restaurant, Grocery Outlet, Auto Zone and Planet Fitness, at the newly remodeled center on N. Raymond Ave. The popular Goodwill store relocated from its previous Fullerton location at College Plaza on Chapman Ave.The new 7,800 square-foot store offers customers an elevated shopping experience and one-of-a-kind assortment of clothing for all ages, accessories, home décor, electronics, furniture, appliances, and more. 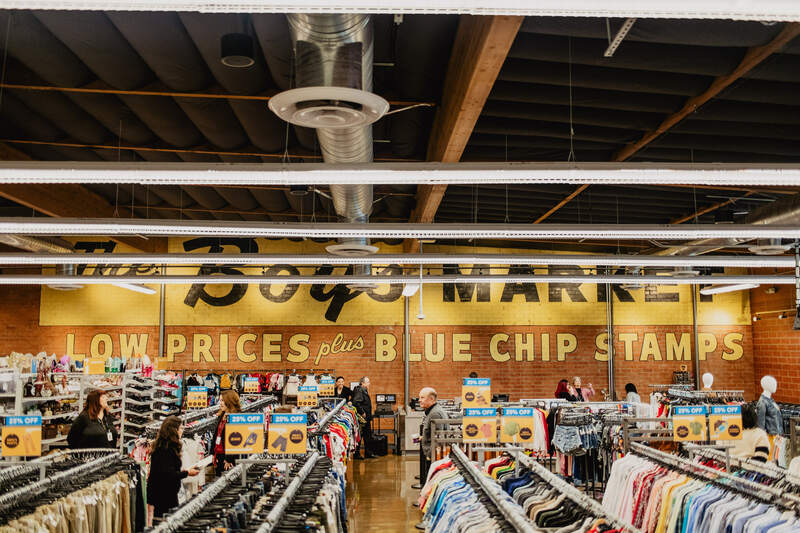 The fresh interior concept includes open wood beam ceilings and a restored original brick wall from Boy’s Market, the family-fun grocery store founded in the 1920’s that once occupied the space. All store employees from the College Plaza location were transferred to the new Fullerton store, which has also created 10 new job opportunities for the local community in various positions. Goodwill of Orange County’s president and CEO Nicole Suydam was joined by Orange County Supervisor Doug Chaffee and other city and county representatives for a special ribbon cutting to kick off the grand opening ceremony. “We are thrilled to open the doors to our new Fullerton store and provide shoppers with a unique shopping experience that is not only memorable, but helps our organization give back to the local community,” said Suydam. Goodwill’s retail outposts generate the revenue needed to operate and provide critical programs and services to Orange County residents who face barriers to employment, including individuals with disabilities and veterans, find and keep meaningful jobs. For every dollar Goodwill of Orange County spends, more than 92 cents furthers the nonprofit’s mission to provide opportunities for these individuals so they can find a pathway to independence and pride. The Fullerton store and donation center is located at 130 N. Raymond Ave., Fullerton, CA 92831. Goodwill of Orange County is still accepting applications for additional positions at the new location. Interested applicants can apply online or by calling (714) 547-6308 ext. 496. Since 1924, Goodwill of Orange County has been in the business of helping people facing barriers find and keep meaningful employment. Founded on the belief that every person should have the opportunity to achieve the independence that work provides, Goodwill is most recognized for being the conduit where donated goods are sold in America’s favorite thrift stores to generate the revenue that provides the services to those who face employment challenges. Goodwill of Orange County, which marked its 94thyear of service in 2018, has supported hundreds of thousands of Orange County residents since its inception by creating and providing quality training and employment services to empower its program participants to be productive and independent. The nonprofit organization has dozens of programs that support this effort, including theGoodwill Rogers A. Severson Fitness & Technology Center, Orange County’s only facility specially designed for people suffering from chronic illnesses and physical disabilities; its global approach to serving veterans and their families, Goodwill of Orange County Tierney Center for Veteran Services, which helps former service members and their families find resources and services to meet and serve their unique needs, including housing, job placement, education, and wellness; and its Assistive Technology Exchange Center (ATEC), which provides access to more than 1,000 state-of-the-art technology devices for children and adults with disabilities. These are just a few of Goodwill of Orange County’s innovative programs that have served those facing barriers in Orange County for the past nine decades. To learn more about Goodwill of Orange County, visit ocgoodwill.org.